Major U.S. retailers from independent chains to store departments regularly sell their store return, overstock and out of season clothing and shoes. 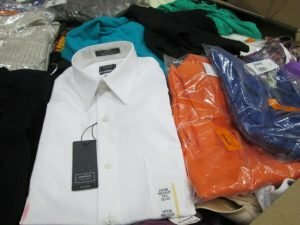 This is referred to as reverse logistics, as we buy and sell the store return clothing and shoes in wholesale quantities. Working with a select group of companies, we supply full loads of store returned clothing and shoes. Bank & Vogue works with many retailers across North America to buy and sell their overstock clothing and shoes. These items of shoes and clothing remain unused, as they are unsold or customer return items of clothing or shoes. Many of these loads are sold and packaged in gaylords and can be sold domestically but some have export restrictions based on brands and store policy. Bank & Vogue works with each North American retailer individually to ensure only the highest quality store returned clothing and shoes are purchased. The clothing and footwear items purchased are unused store returns or overstock, unsold items, ensuring the clothing and shoes are in great condition upon purchase. 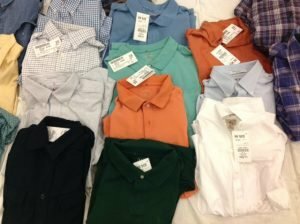 Many of the retailers we deal with are going through a liquidation process or store closeout, allowing for the purchase of high quality clothing and shoes in bulk, wholesale quantities. As a shoe and clothing returns supplier Bank & Vogue sells the purchased store return clothing and shoes in bulk as a reduced rate. Contact us today to purchase store return clothing and shoes for you store, home and more.